The Malayalam movies releasing this week are Cousins, Loka Samastha, Ivan Maryadharama, Marine Drive and Aamayum Muyalum. The story of the film follows four cousins on a journey with a mission and explores the adventures they come across. The story of the movie occurs at the backdrop of a big housing colony in a city. It shows the change in the lives of its residence with the entrance of Gayathri as a paying guest. It is a remake of 2010 Telugu blockbuster film “Maryada Ramanna. Touted as a comedy film, it will be shot fully at Pollachi in Tamil Nadu. 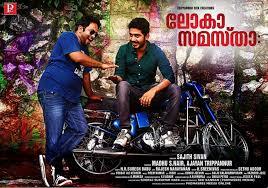 It is supposed to be one of the biggest budget films in the Malayalam film industry. This is a movie that is a psychological romantic thriller, but not much more is known about it. Aamayum Muyalum is set against the backdrop of a village of thieves. What happens when a government servent (Anoop Menon) enters the scene is the crux of the story. Jayasurya will play the young thief.